Hazardous particulate levels were detected in seven districts of Bangkok and in areas of five adjacent provinces on Monday morning -- Nakhon Pathom, Nonthaburi, Pathum Thani, Samut Prakan and Samut Sakhon. Chayapol Thitisak, director-general of the Department of Disaster Prevention and Mitigation, said unhealthy levels of particulate matter of 2.5 micrometres or less in diameter ranged from 54 to 87 microgrammes per cubic metre of air over the previous 24 hours. The maximum safe threshold is 50mcg. 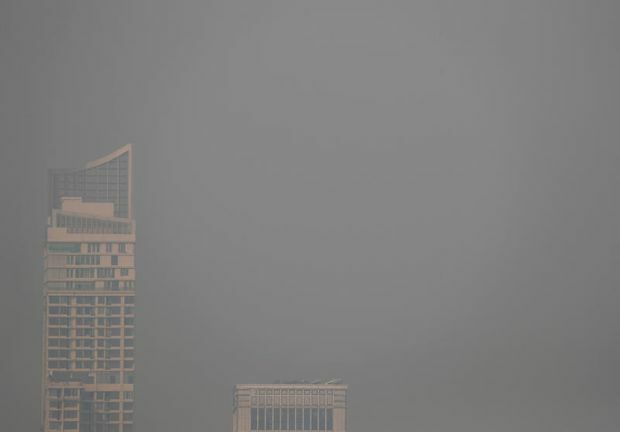 A condominium tower is seen through polluted air during a poor air quality day in Bangkok on Monday. Bangkok has been gripped by a suffocating period of dire air pollution in recent weeks, with seasonal atmospheric conditions, unfavourable winds and the city’s significant self-generated fumes forming a toxic combination. Parents rush to pick their kids up from school after the government ordered schools in Bangkok and nearby provinces to temporarily close from Wednesday until Friday.